Friday, November 30: For the second time this year, your friendly neighborhood “Travelin’ Man” is going coast to coast. 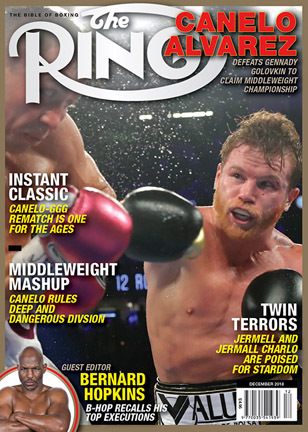 In late July, I flew from Pittsburgh to Los Angeles to chronicle the Showtime Championship Boxing card topped by Mikey Garcia’s lightweight title-unifying decision victory over Robert Easter Jr., a fight in which Garcia was challenged by Easter’s stick-and-move tactics in the early rounds and a fight in which Garcia produced an emphatic response in the final four rounds by out-landing the Ohioan 95-34 overall and 58-13 power to lock down the victory. 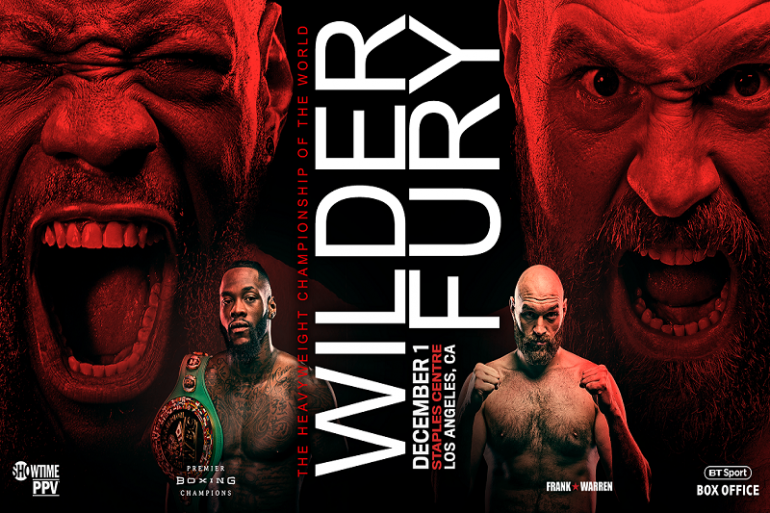 Now on the final day of November, I am returning to the Staples Center, in the “City of Angels,” to chronicle one of the year’s most consequential fights: WBC heavyweight titlist Deontay Wilder’s showdown with Tyson Fury, the owner of the heavyweight championship line of succession, thanks to his November 28, 2015, victory over Wladimir Klitschko and to the fact that he has yet to be beaten inside the ring. Barring a draw, no-decision or no-contest, history could be made on both sides. * If Wilder finishes the fight inside the distance, he will register his eighth consecutive KO in defense of the heavyweight title, which would tie him with Tommy Burns and Larry Holmes for the longest such streak in division history. 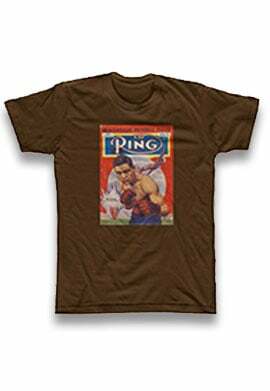 He is currently tied with Joe Louis with seven straight knockouts in heavyweight title fights but “The Brown Bomber” has more than a leg up on “The Bronze Bomber” in that Louis put together three seven-defense streaks. * Should Fury win, he will join Lennox Lewis and Herbie Hide as the only English fighters to have two or more heavyweight title reigns while also becoming one of the few “lineal” titlists to return from inaction and dethrone a reigning beltholder. Retired or exiled champs Jim Jeffries, Joe Louis and Muhammad Ali couldn’t defeat Jack Johnson, Ezzard Charles and, in Ali’s case, Joe Frazier and Larry Holmes. One advantage Fury has over Jeffries, Louis and Ali is youth: While the 30-year-old Fury is three years younger than Wilder, the 35-year-old Jeffries was three years older than the 32-year-old Johnson; the 36-year-old Louis was seven years older than the 29-year-old Charles and the 29-year-old Ali was two years older than the 27-year-old Frazier and, at age 38, was eight years older than Holmes. Worse yet for Jeffries, Louis and Ali (the second time around), they tried to pull off the feat without a single warm-up fight. As for Ali’s first attempt to regain his belt, he had two preparatory fights against Jerry Quarry (the No. 1 contender at the time) and the rugged Oscar Bonavena, who extended Ali to the 15th and final round, and Fury has had two outings since his return (a farcical TKO 4 over Sefer Seferi and a shutout 10-round decision over Francesco Pianeta). Of course, a win over Wilder would be just step one of Fury’s process: to once again become “the man” in the purest sense. He will, at least to date, have to defeat IBF/WBA/WBO titlist Anthony Joshua, who is nearly 10 months younger than Fury. And unlike his triumph over Klitschko, a Fury win over Joshua as a WBC titlist would make him the first unified heavyweight champion in the “four-belt” era (as would Joshua if he defeated Fury under this scenario). Also should Fury upend Wilder, his feat would mirror one completed by his namesake Mike Tyson. On March 16, 1996 – in just his third fight back from a three-year prison sentence, Tyson flattened Frank Bruno to regain the WBC title, as well as his reputation as “the baddest man on the planet.” If Fury wins, he will have regained a piece of the title in his third fight back from circumstances that caused many to assume his ring days were over: Mental illness that left him spiritually tortured and an enormous weight gain that gravely threatened his physical health. 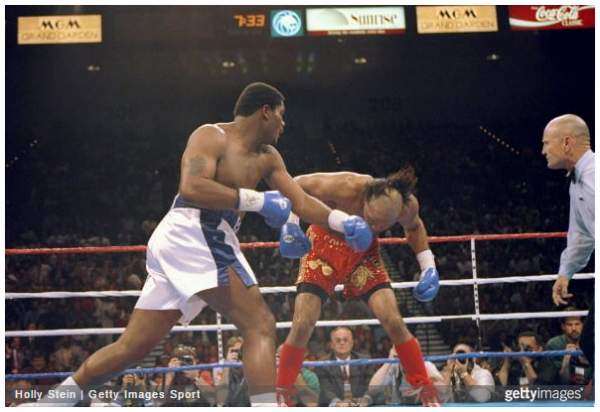 The incident that ignited this rivalry took place eight years earlier at the 1987 Pan American Games, in which Bowe and Gonzalez met in the super heavyweight semifinal. The 19-year-old Bowe reportedly insulted the 22-year-old Gonzalez’s mother before the match, prompting the infuriated Cuban to dish out a severe beating that included two knockdowns and two standing eight-counts. Bowe managed to survive until the final bell and Gonzalez went on to defeat Lennox Lewis in the gold medal match. For Gonzalez, the victories over Bowe and Lewis in the same amateur tournament was a defining highlight of a career that included 220 wins, 168 knockouts and 13 losses – eight of which were by disqualification. Much had changed in the years since their August 1987 meeting. Bowe, now 27, was a former three-belt heavyweight champion, who was making the first defense of the WBO strap he won from Herbie Hide three months earlier, a sixth-round knockout that lifted “Big Daddy’s” record to 36-1 (with 30 knockouts). Meanwhile Gonzalez continued to fight for Cuba but, in 1991, he became one of the first high-profile amateur stars from that island nation to defect to the United States. After relocating in Miami, Gonzalez turned pro in June of that year, stopping William Campudani in three rounds. 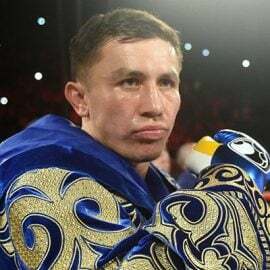 Over the next four years he racked up a glossy record of 23-0 (with 22 KOs) but was heavily criticized for his quality of opposition. 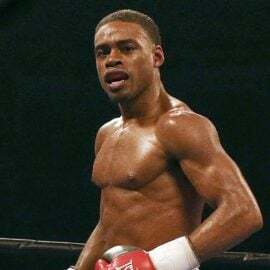 His best-known victim was Renaldo Snipes, who, at 37, was far removed from his best days and, after being stopped in the 10th and final round, never fought again. Both men’s recent ring efforts were clouded by criticism. Since losing to Evander Holyfield more than 18 months earlier, Bowe flirted with disqualification by hitting Buster Mathis Jr. when Mathis was on the canvas (the bout was ruled a four-round no-contest) and his bare-knuckled one-two on Larry Donald’s jaw at a press conference five days before the fight prompted Donald to file assault-and-battery charges but little else, as he lost a tame 12-round decision. As for Gonzalez – who proudly wore a black hat while walking into the ring, spewed curses, and whose bizarre cut prompted HBO’s Larry Merchant to declare Gonzalez had had a “bad hair life” – his taunting of Snipes and his unwillingness to put him away until the final moments drew boos, boos that further stoked Gonzalez’s drive to succeed. A pair of incidents during the pre-fight build-up moved the Nevada State Athletic Commission to bar Bowe and Gonzalez from appearing together at news conferences, weigh-ins and other events connected with the fight. The hype narrowed the betting line favoring Bowe from 4-to-1 to 12-to-5 and the electric atmosphere was elevated by a black-hatted Gonzalez stepping over the top rope and Bowe entering the area to James Brown’s “The Payback.” The hate that permeated the venue extended to the audience, which booed both men’s names. “Generally when there’s a lot of smoke, there’s just a whole lot more smoke,” analyst George Foreman replied. As combative and competitive as the build-up had been, the fight itself laid bare the vast gulf between the pro versions of Bowe and his mandatory challenger. Though scaling 243 – six pounds heavier than the 6-foot-7 Gonzalez – the 6-foot-5 Bowe’s physique looked toned and primed to dish out punishment. And dish out punishment he did. Bowe repeatedly maneuvered Gonzalez to the ropes and blasted away at the head and body with searing accuracy and powerful impact. In round one, Bowe out-landed Gonzalez 35-8 in total punches and connected with a mind-blowing 81% of his jabs (13 of 16) and, in round two, Bowe landed 19 of his 20 jabs – or 95%. Conversely Gonzalez looked confused, lost and, at times, overwhelmed. Blood soon seeped from Gonzalez’s mouth and between rounds his normally animated face wore a dazed, blank expression. At the end of round four – a round that saw Bowe out-land Gonzalez 53-6 – Bowe tempted fate by landing an overhand right a full three seconds after the bell. 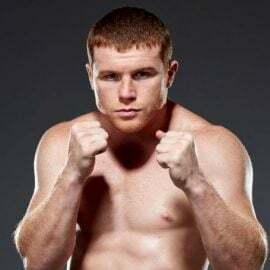 No warning or penalty was assessed and the fifth saw Bowe continue to beat the bravado out of Gonzalez, who, at round’s end, trudged to his corner and plopped onto his stool. The end came in round six when Bowe’s right to the side of the face caused Gonzalez to fall forward into the ropes. Referee Mills Lane stopped his count at eight and it would be three more minutes before the Cuban could regain his feet. The beating was severe and the final CompuBox statistics illustrated the degree of Bowe’s dominance: Bowe landed 188 of his 302 total punches (62%) – including an incredible 83% of his jabs (99 of 120) – while Gonzalez connected on 51 of his 161 punches and was outdone 89-17 in landed power shots. It was Bowe’s best performance since his title-winning triumph over Holyfield in November 1992 and both Bowe and chief second Eddie Futch believed it would serve to restore belief in the fighter’s worth. How will the hate and fury between Wilder and Fury manifest itself in the ring? It’s anyone’s guess. “If Fury’s mission was to conceal what he really has from Wilder, he’s done a stupendous job because neither (Sefer) Seferi or (Francesco) Pianeta had sufficient skills to draw Fury out of his playful shell. 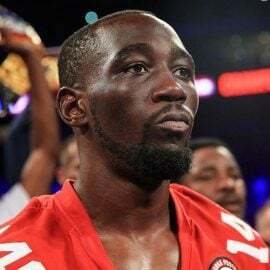 While Fury will be the first title-fight opponent to own height and reach advantages over Wilder, he boasts only modest shot-for-shot power (which shouldn’t seriously test Wilder’s ability to take a punch) while Wilder is a legitimate one-punch KO artist. To compensate, Fury must force a fast pace by flooding the zone with punches and do so as a switch-hitter who also will throw an endless variety of head, shoulder and foot feints. Wilder has never been a ball of fire in terms of volume, and if Fury uses this game plan the champ’s output may drop to a dangerous level. My analysis and final prediction was not a giant leap because it ended up being in line with conventional wisdom. Though I didn’t choose a round in the analysis, I told people privately that I thought it would end in round 10 because I anticipated an early war of nerves that could extend to the fight’s second half. Would I be proven right? Or will the intangibles of the prize ring again prove that while experts’ assessments often play out as predicted, they truly don’t know anything until the fighters have their say. My journey to Los Angeles began at 8:30 a.m. on a typically dreary West Virginia November morning – drizzle and 37 degrees. Although my plane wasn’t scheduled to leave until 1:10 p.m., I gave myself extra time just in case the detour on the I-470 East overpass was still in effect. It was but I still arrived at the airport shortly before 10:45, 15 minutes ahead of my goal time. I found a space directly across from the 13E sign in the extended parking lot, a pretty good spot, all things considered. My trip through the TSA Pre-Check security line, however, hit a snag. The agent removed my laptop bag from the conveyor belt once, then twice, before giving it to a female agent that conducted a physical search. It turned out the issue was that the plug for my new laptop was splayed in such a way that it blocked the X-ray from ascertaining other items in my bag. Thanks to my increased use of Southwest, my boarding pass read “B-29.” For the uninitiated, Southwest, unlike most airlines, does not have assigned seating. Instead passengers are divided into three groups of 60 and are defined as “Group A,” “Group B” and “Group C.” Upon boarding the aircraft, passengers are allowed to sit wherever they wish but the options dwindle with every succeeding place in line. Based on my experience, Group A passengers are guaranteed to snag their desired window or aisle seat, while many in Group B should feel decent about their remaining options. Group C passengers, on the other hand, will likely end up in an undesirable location, such as the very back of the plane, near a bathroom or in the dreaded middle seat. Additionally overhead space dwindles to the point in which those passengers will have to check their luggage and I learned early on that avoiding baggage claim is always the best policy. Because I drew “B-29,” I would theoretically be the 89th person to board after military personnel, wheelchair-bound passengers and other early boarders. Given that this would be a five-hour flight, I didn’t want to tempt fate, so I opted to upgrade to “Business Select,” which, in this case, for $40, moved me up to A-7. It’s funny how life can present one with circumstances that makes one think someone higher than himself is playing a role in what occurs. Two such incidents occurred here. First, seated to my right at Gate 3A, was a young couple and I overheard the man tell his companion about the 2018 boxing-themed documentary “Cradle of Champions.” Upon hearing this, I asked the man if he had a favorite fighter from the series and although he said he didn’t, he said he and his companion were headed to Los Angeles to see the Wilder-Fury fight. When I told him I was going to be a punch-counter at the fight, he asked me about the recent CompuBox record-breaking fight between Jesus Soto Karass and Neeco Macias, then recognized me as the “Travelin’ Man” on RingTV.com. Who knew I’d run into a fan? The second ended up being much deeper in scope. While I was conversing with the couple to my left, a slim and attractive woman took a seat to my immediate right. When we lined up to board the plane, I (A-7) was standing directly across from her (A-38). Then after choosing a window seat in row six, she opted to take the aisle seat. I wasn’t sure if she did so because she saw me at the two other places but I certainly recalled the association. “Hello, neighbor!” I breezily said as she took her place, a greeting that got the hoped-for smile. The boarding process ended without anyone taking the middle seat, so we had our little section to ourselves, which freed us to engage in unencumbered conversation. It turns out her name is Dorothy Andreas – president of The Sewickley Spa, the owner/operating partner at The Greene Turtle in McHenry, Maryland, a self-made pioneer in the beauty industry (she opened a day spa when that concept was in its infancy), a highly-awarded businesswoman as well as a sought-after public speaker. She was one of the first to engage in e-commerce when, in the early 2000s, she provided a platform for customers to print their own holiday gift certificates, a venture that brought in $21,000 in the first 24 hours it went live, after which she sold the program to other businesses. She shut down the operation a few years ago when better technology became available. Not content to rest on her laurels, Dorothy is about to add another title to her resume: Author. Sometime early next year, she will release a book titled “Eliminate Chaos from Your Service Business.” After exchanging our life stories during the entirety of our five-hour flight – and her story is one that has been filled with twists, turns, tragedies and triumphs – I can say that if anyone is equipped to teach people how to cope with chaos and to conquer it, it is Dorothy Andreas. “Service business is hard,” she said via email. “This book deals with how to keep balance for yourself as you grow your business, develop your brand, build your bank account and attract clients that you want. It also covers subjects such as fads, trends, business cycles, integrity and leadership.” She told me the book would be less than 100 pages in length, which means there will be a lot of knowledge packed into a tiny space. Anyone who has read my articles and books knows that it takes a thousand words and 100 pages just to get warmed up. By the time we left the aircraft, we felt as if we had known each other for years, for while we had to travel different routes, we both rolled the dice and trusted that our abilities would take us to our respective mountaintops. We exchanged business cards and promised to keep in touch. I took a taxi to our crew hotel, which was the same place we stayed in July and is located within walking distance of the Staples Center. Just before I arrived, I spotted a mural of Muhammad Ali on the side of a nearby building, then, moments later, I received a text from CompuBox colleague Dennis Allen that the day-before electronics checks had proceeded perfectly. Because of that night’s game between the Mavericks and the homestanding Lakers, the tests had to be conducted inside the production truck instead of at the work station on the arena floor. After checking into my fifth-floor room and making the usual “I’m all right” calls, I took the elevator downstairs to purchase a snack from the lobby’s mini-mart, then, a bit later, returned to the lobby to get my credential from Dennis. Because fight talk was everywhere – and because I will indulge anyone, at length, in such talk – it wasn’t until an hour had passed before I returned to my room. As is often the case following a long travel day, I didn’t feel much like working, so I spent the next few hours eating my snacks and catching up on all the news I had missed. Not long before turning out the lights, I learned that former President George H.W. Bush – the longest-living former U.S. president in history – had passed away at age 94. That news stirred me from my semi-slumber and it wasn’t until more than an hour had passed before I switched off the light. Saturday, December 1: Staying on Eastern Time, I awakened at 5 a.m. and spent the next several hours writing most of the words you’ve read so far. Although we were told by Sports Media to show up at the arena at 2 p.m., I let them know that Dennis and I would come over if everything was ready before that. At 11:25 a.m. I received word that we could come over and within an hour we got all the green lights we needed to indicate we were ready to count. In looking over the bout sheet, I wanted to count four of the eight untelevised undercard fights because I believed we needed the data for future bouts. It didn’t work out that way; heavyweight Chris Arreola’s sixth round stoppage over Maurenzo Smith – his first fight in 28 ½ months – was staged after the main event had ended and super middleweight Alfredo Angulo’s scheduled bout with Eduardo Flores didn’t even take place. However Dennis and I did count welterweight Robert Guerrero’s comeback fight, a second round KO over Adam Mate, and junior middleweight Julian Williams’ second round stoppage of Francisco Javier Castro. In the hours before the show, I said hello to several ringsiders. One was former title challenger and card-carrying warrior Librado Andrade, who now works in fighter relations for Premier Boxing Champions. We chatted about his career, which was highlighted by his two fights with Lucian Bute (the first of which saw Andrade controversially denied a last-second KO victory), his brave loss to a prime Mikkel Kessler and victories over Robert Stieglitz (TKO 8), Otis Grant (TKO 7), Yusaf Mack (TKO 7) and Eric Lucas (TKO 8). When recounting some of the ups and downs in his career, he asked me, “But I never gave a bad fight?” I replied, honestly, “You never gave a bad fight.” At that, he smiled and we shook hands. I also said hello to ring announcer/blow-by-blow man Ray Flores and spoke with his younger brother Miguel, who, at 25, has already been a ring announcer for eight years. 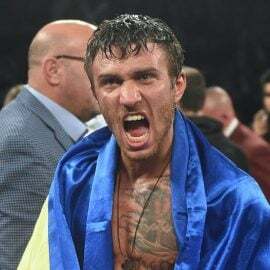 He announced the deep undercard fights and, based on what I saw here and on other occasions, will surely move up the ladder just like his big brother. 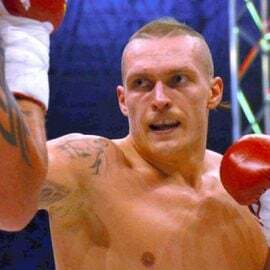 The opening fight of the show saw England’s Isaac Lowe, a featherweight, lift his record to 16-0-3 (with 6 KOs) by stopping Argentine journeyman Lucas Baez in round five. The switch-hitting Lowe, who began the fight at long range, soon moved into the trenches and asserted his power by flooring Baez with a long right to the chin, then doing so again with a combination highlighted by a right to the ear. Baez arose but was deemed unfit to continue. With the loss, Baez now stands at 34-17-5 (with 18 KOs). 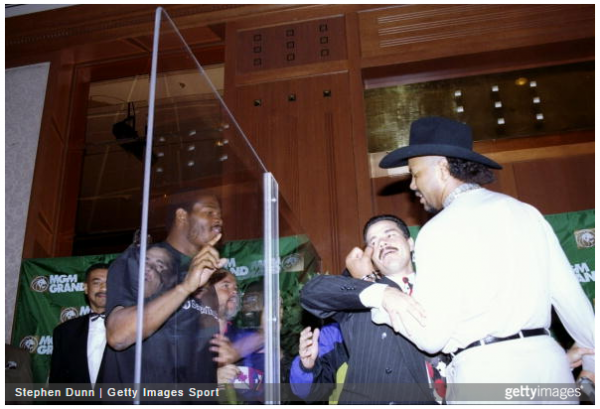 Guerrero’s blowout of Mate closed the pre-televised festivities and, not long after, the Showtime Pay-Per-View portion of the show began. Dennis and I did our best to guess the number of rounds the four fights would accrue; he guessed 20 rounds while I chose 24 (Joyce KO 3 Hanks, Ortiz KO 2 Kauffman, Hurd KO 9 Welborn and Wilder KO 10 Fury). Which one of us would get closer? And would we even be right? No matter what, I couldn’t help but think that the dream I formed nearly four decades ago was now at its fullest flower: Being at ringside at a top-notch heavyweight championship contest and getting the chance to write about what I saw. For my impressions on what happened during the pay-per-view, please read Part Two. Lee Groves is a boxing writer and historian based in Friendly, West Virginia. He is a full member of the BWAA, from which he has won 16 writing awards, including two first-place awards, since 2011. He has been an elector for the International Boxing Hall of Fame since 2001 and is also a writer, researcher and punch-counter for CompuBox, Inc. He is the author of “Tales from the Vault: A Celebration of 100 Boxing Closet Classics” (available on Amazon) and the co-author of the newly released book “Muhammad Ali: By the Numbers” (also available on Amazon). To contact Groves about a personalized autographed copy, use the email [email protected] or send him a message via Facebook.